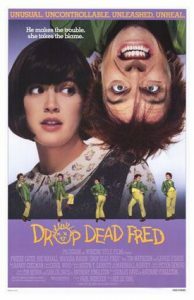 One of the fastest ways to get me to turn into a 10-year-old girl is to put on the movie Drop Dead Fred. It came out in 1991, and it was love at first sight (right now, the theme song is stuck in my head). 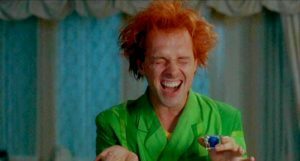 In the movie, Elizabeth (Phoebe Cates) is a woman going through a tough time that gets some unlikely support: the reappearance of her imaginary friend, Drop Dead Fred (Rik Mayall). Hilarity ensues. Here are five reasons to watch it this weekend. Maybe I’m just a simple creature, but pranks make me laugh. I am just one of those folks that responds well to physical comedy. Go ahead and accuse me of being childish, but it’s just funny when someone gets hit with something. In part, we laugh at someone else’s misfortune because it’s not happening to us. It’s even better when it happens to someone we don’t like, such as a cheating spouse or a nasty, condescending parent. There’s something incredibly funny about screwball antics, and this film is terribly funny. For a comedy, this film tackles some heavy subject matter: the dissolution of a marriage, and the impact it has the spouse who didn’t want the split. Elizabeth is heartbroken over the fact that her beloved husband Charles (Tim Matheson) is leaving her for another woman. We watch her try to win him back, and try to put her life back together. It’s tough, but in the modern age of at least 50% of marriages ending in divorce… it’s nice to know that someone else has gone through the same feelings. I know at least three people that have a mother like Polly, and trust me, everybody hates her. Mason’s portrait of Polly is pretty spot on, and it doesn’t hurt that she’s well-written. While some may consider her over-the-top, she’s actually pretty close to a bitter, abusive parent. If you’ve ever had the misfortune of knowing a Polly, you’ll find it chilling. In this instance, comedy is way closer than drama. The concept of this film is quite genius: while going through something tough, your imaginary friend reappears to save the day. There’s something so sweet in that sentiment. At the time when you have to be a grown up and move forward, there’s always the option to let go and be a kid for a little longer. Really, that’s the answer sometimes: close your eyes and lose yourself in the magic, and remember that not everything has to be serious. You can rent this one on Amazon. If you’re in the mood for a good laugh, go on ahead and treat yourself.